A beautiful Mothers Day Chocolates box featuring approximately 31 of our award winning chocolates presented in a luxury round linen feel box tied with a wide satin ribbon. 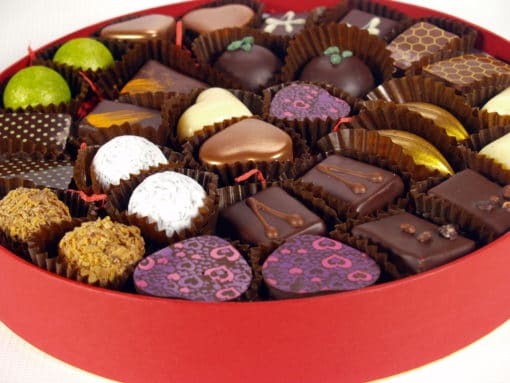 We’ve included beautiful and delicious chocolates including Strawberry and Balsamic caramels, salted caramels, Rose creams and meltingly soft pralines. Approximately 300g – 31 chocolates. 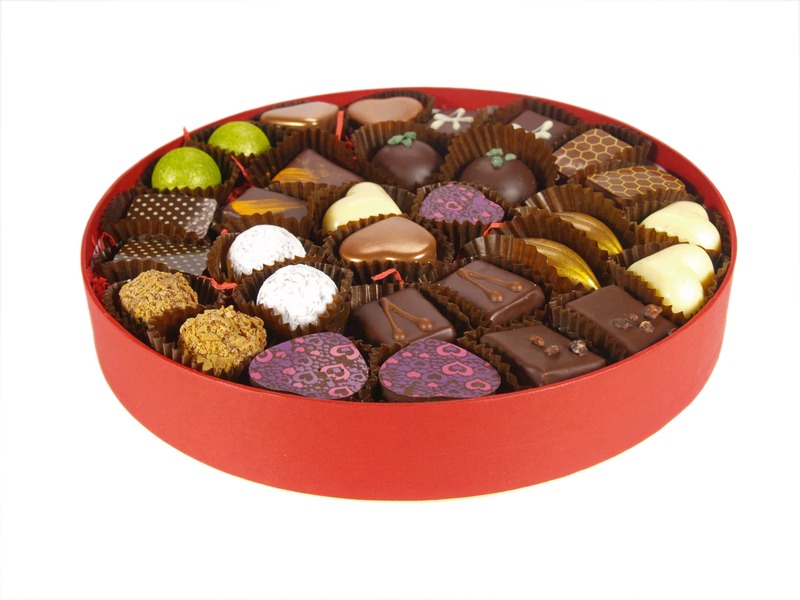 A beautiful Chocolates box featuring approximately 31 of our award winning chocolates presented in a luxury round linen feel box tied with a wide satin ribbon. approx weight 300g 31chocolates. box 22cm diameter x 3cm deep. We have listed a set of typical ingredients below and highlighted the main allergens. However it is likely that ingredients may vary in this collection, so if you have a particular concern or allergy please contact us or tell us in the order notes. 100% Recyclable – plastic free packaging.. The box is made from card. Please recycle it in cardboard recycling. I received the box packed nicely and expected perfection. Sadly it was a bit short. 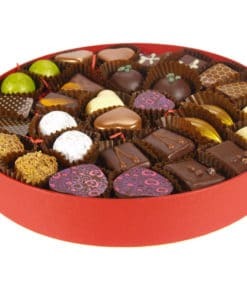 Quantity and quality of chocolates great but internal packaging a disaster. You really need plastic compartments in a tray or at the very least a corrugated cushion on top of them. They were jiggled all over the place and one with a transfer on the top had come off the chocolate. If you want a test customer for an improved style I’ll be glad to help! Godiva from Germany do the box intervals perfectly. Thanks very much for the second try! The box arrived in good shape with only one chocolate out of place. My Wife is thrilled to have two boxes instead of one! Will report back after tasting has completed!